The reality of global intelligence gathering long ago outstripped the fiction of Orwell's Big Brother. It took Edward Snowden to reveal the extent of the US government sanctioned monitoring of every aspect of the lives of its own citizens and trusted allies. Privacy is a redundant concept in the age of satellites, drones and ingenious computer programmes. Did Snowden's actions as a whistleblower make him a fearless patriot or a shameless traitor? There is probably little doubt over which side of that debate director Oliver Stone is likely to favour. Snowden may be unsurprising but it still emerges as a solid, old-fashioned biopic with a dynamic approach to a densely packed story. 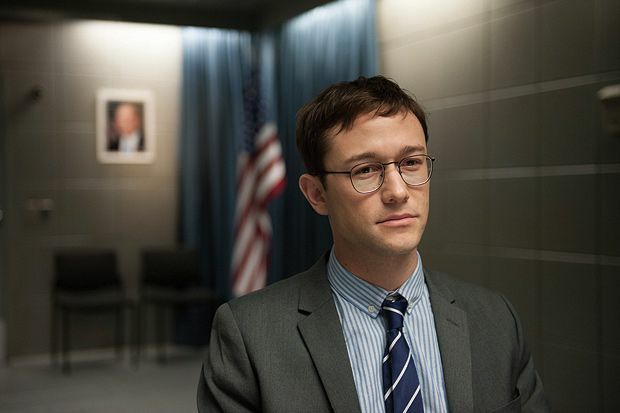 Stone starts in the Hong Kong of 2013 as Snowden (Joseph Gordon-Levitt) is ensconced in a hotel room with filmmaker Laura Poitras (Melissa Leo) and journalists Glenn Greenwald (Zachary Quinto) and Ewen MacAskill (Tom Wilkinson). Snowden has decided to go public with all that he has witnessed and absorbed over the past decade as a member of the CIA and other agencies. In flashbacks, the film watches Snowden change from a boyish, clean-living patriot with a brilliant mind to a man who has gradually surrendered his naivety. He has grown disillusioned by the deception and hypocrisy that lies at the heart of his own government. It is a journey that is smartly dramatised, absorbing and graced by some fine performances, not least a lean, smoothly sinister Rhys Ifans as Snowden's CIA mentor Corbin O'Brian, and Gordon-Levitt who is completely convincing as Snowden, capturing the physical mannerisms and earnest Boy Scout nature of a man who continues to believe in the power of the people to demand change and hold their elected officials to account. Maybe he hasn't entirely lost that naivety after all. Screening as part of the Toronto International Film Festival 2016. General release TBC.